Today for Day 3 of these festive 12 Days of Cookies, I went with something a little different and one that sort of caught me by surprise. Not long ago, I stopped in a Chinatown bakery for a few cookies. On a whim I threw a sesame cookie into the mix, which is odd because I’m not the biggest fan of sesame seeds. Turns out it was pretty good and it spawned an idea and a flavor I haven’t really explored for this whole one dough/many cookies thing. I like to mix things up so let’s give Orange Sesame Crisps a whirl, shall we? I really liked the combination of citrus and sesame together and particularly liked orange and sesame so to the basic dough I’ve added a good amount of fresh orange zest and a little almond extract. To make the cookies nice and crispy, I added some additional sweetners – honey and brown sugar in this case. 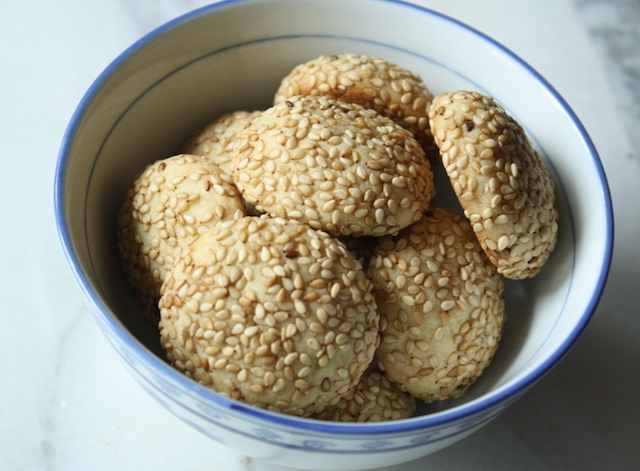 Rolled into balls then coated pretty heavily with toasted sesame seeds, you get a cookie with a brand new flavor profile that might lean a little toward the savory side and has a great crispy-crunchy texture. For someone who is not a big sesame fan, I really enjoy these especially with a cup of tea. Quite nice and rather adult, if I do say so. STRESS THERAPY BAKING FACTOR: SURPRISE SURPRISE. Well these were a delightful surprise! They’ll add a really nice mix to your holiday lineup and not one you’d typically find nestled in the Christmas cookie plate. Give it a try. And keep them in mind for the future as they’d be a great ending to an Asian-inspired meal. Not too sweet, not too big, just right. Preheat the oven to 350°F. Line two sheet pans with parchment paper. Add the basic butter dough to the bowl of a standing mixer fitted with the paddle attachment. Add the remaining ingredients – sesame seeds, orange zest, almond extract, baking soda, honey, brown sugar – and mix on medium until fully combined. 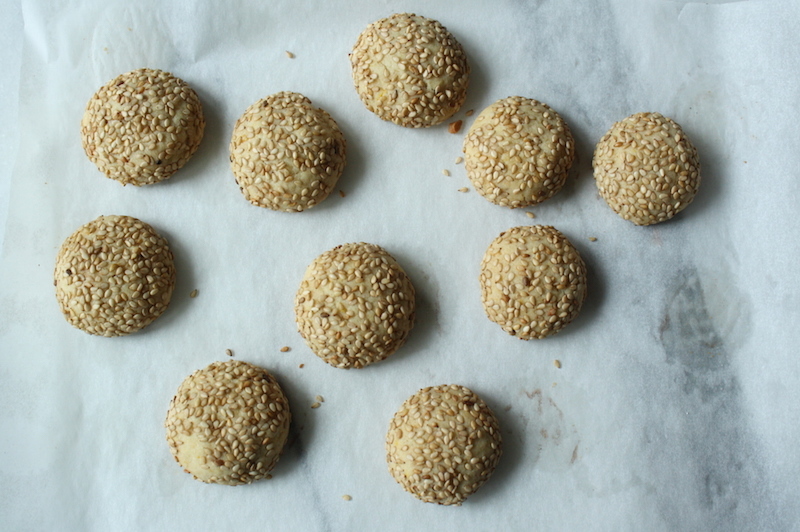 Roll tablespoon sized pieces of dough into nice, round balls and roll to coat fully in sesame seeds. Arrange cookies 1 ½” apart on parchment paper lined sheet pans. Bake 10-12 minutes, rotating the pans halfway through baking, until they feel just firm to the touch and are lightly golden on the bottoms. Do ahead: Dough can be made ahead and frozen up to 3 months. I like to roll into balls (without the sesame seed coating), freeze until solid on a sheetpan and store in a Ziploc bag labeled with the baking time and temperature. Let defrost a bit so the sesame seeds will stick while coating and bake as directed.